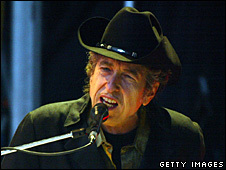 Music legend Bob Dylan is "talking to a couple of car companies" about becoming the voice of their GPS system. The singer-songwriter discussed the possibility on his BBC Radio 6 Music Sunday show which was on the theme of street maps. Renowned for his raspy, nasally tones, the 68-year-old American gave his listeners a taster of what his directions might sound like. "Left at the next street. No, right. You know what? Just go straight." He continued: "I probably shouldn't do it because whichever way I go, I always end up at one place - on Lonely Avenue. Luckily I'm not totally alone. Ray Charles beat me there." The normally reclusive Dylan, whose hits include Blowin' in the Wind and Like a Rolling Stone, admitted he does not normally like telling people what he is doing. His Theme Time Radio Hour is on Mondays at midnight. The singer is currently on hiatus, and this week's show was a repeat. His comments had not previously been reported. Comedian John Cleese is one of several celebrities who have already lent their voices to sat-nav devices. Other sat-nav voices include Susan Skipper, who appeared as Nigel Havers' posh girlfriend in the 1980s sitcom Don't Wait Up; and Eve Karpf, who voice-dubbed the famous line: "Monsieur, with these Rocher you are really spoiling us" in a chocolate commercial.